JCPenney hosted a “Suit-Up” event September 8 at River Ridge Mall. The event lasted from 9 a.m. until noon. The “Suit-Up” event is tailored for aspiring professionals, in need of a workforce-ready wardrobe at a reasonable price. JCPenney offered great deals, including 40 percent off on all career wear, free consultations and additional coupons. Sephora even offered mini-makeovers and free giveaways. All customers with a Flames pass qualified for the discount and free gifts. Liberty students swiped in with their Flames pass and entered a raffle for prizes. Students shopped together as they took an important step towards a successful career. A professional wardrobe is a necessity when it comes entering the workforce. Liberty University Career Center representative Sarah Falwell said the event is great since it allows Liberty students a chance at the beginning of the school year to purchase professional wear for their upcoming interviews and job fairs. Falwell said it is important to practice career-readiness early in the year. Liberty student Michael Christensen and some of his friends took advantage of JCPenney’s “Suit-Up” opportunity. He added that it is best to start now, rather than later. 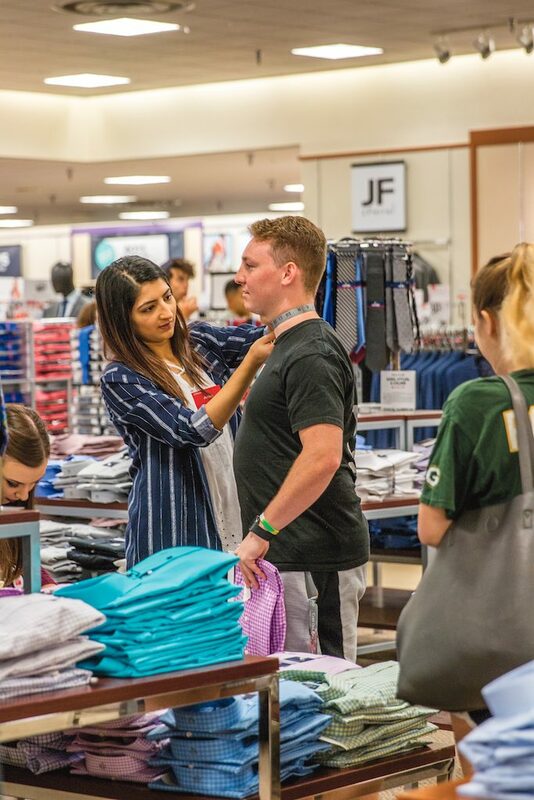 JCPenney partners with college campuses across the United States, such as the University of Virginia, to host the “Suit-Up” event. This is Liberty’s first time partnering with JCPenney for the “Suit-Up” event. Falwell said it might become an annual occurrence for Liberty, based on the turnout. For more information on JCPenney’s “Suit-Up” events in the future, visit Liberty University Career Center in Montview Student Union or their website.